Since reading your book \’Smart Women Finish Rich\’ I have started to control my spending to an extent I never thought I could achieve. I have a lot of debts and always struggled to make ends meet, often running out of money two weeks after payday! 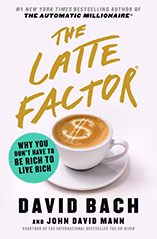 My latte factor was beauty products and magazines,which I realised after taking your calculator were costing me around £150 a month! Since reading your books Ihave turned this around,stopped the unnecessary spending and now make overpayments on my debts using your DOLP method. I predict my debt free date to be November 2011! Amazing! I have a budget now which I always follow and even have money left at the end of each month! Something that never happened before. Also I have opened a personal pension plan to look after me when I am an old lady, have a car fund and xmas fund to help me save for these large costs and have opened an ISA with an excellent rate (which I plan to fill with mortgage deposit savings!) Because I am British I have to convert some of the things you suggest into an alterntive over here, but you are very easy to follow and motivate me no end! Thanks so much for helping me take control of my finances.